Braun & Hogenberg -Calechut Celeberri mum India Emporium. Braun & Hogenberg - Calechut Celeberri mum India Emporium. Title : Calechut Celeberri mum India Emporium.. Date : Cologne, ca. 1581. Size : 13.0 x 18.5 inches. / 33.0 x 47.1 cm. Description :A finely rendered presentation of three Indian Ocean port cities and one African, that formed part of the Portuguese maritime empire. The larger upper half plate (Calicut) provides much detail, showing ship building and fishing activities. 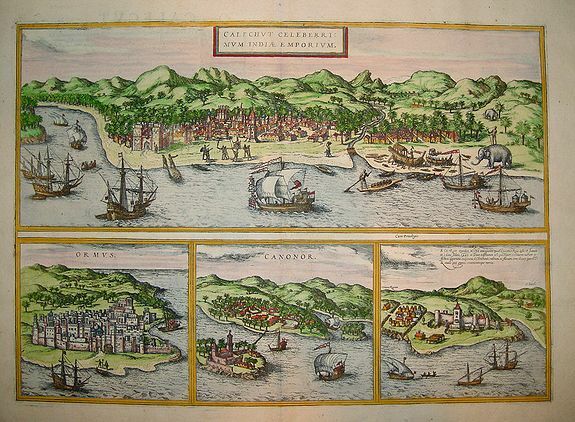 Various ocean and harbor vessels are depicted along with a number of elephants. The Mina section (lower right) contains information regarding the town's establishment. Verso text in Latin. Very decorative. Condition : In very good to near-excellent condition. Crisp, dark engraving on strong paper with well-sized margins. A few tiny chips in the upper right margin edge.